R.B.I. Baseball was a staple in the early 8 and 16-bit sports video games. Namco originally developed the ever-so-popular original R.B.I. Baseball, which was published by Tengen way back in 1987 for the NES. It enjoyed healthy installments on everything from the NES, SNES, Game Gear, PC, and Genesis and seemed to grow bigger and better with each new installment. Just about any and everyone who was into video games and baseball had played one version or R.B.I. Baseball or another for one of those mentioned consoles. Tengen eventually started to lose steam and started publishing the R.B.I. series through Time Warner Interactive, and it seemed to be in a position to move the series forward in new and great directions, including the next generation of 32-bit consoles. However, before the series made the big leap, Tengen decided to basically cash in on the 32X and released what was supposed to basically be a 32-bit quality port. When you start talking about R.B.I. Baseball ’95 you need to keep the “cash in” phrase close to heart because the game was a monumental failure for the franchise that killed it, and it probably helped bury Tengen as a company (actually the failure of Atari, being Tengen’s parent company, was probably a bigger factor, but I won’t go there in this review). I picked up a complete copy of this 32X rarity for a great deal on eBay, fully knowing that it was going to be a poor game because I had read a few reviews for it highlighting its many failures. When I finally started playing it I realized just how bad this game was. Right from the start, R.B.I. ’95 just screamed “rush job.” It all started with the title screen which was basically no different from any previous installments. You hear an announcer say “RBI…,” literally about that anti-climactically. The voice acts like it’s going to finish the entire name of the game from its tone, but it just chops off, which is just plain cheap sounding. The title screen isn’t the only failure audio-wise, but I’ll touch more on the rest of the sound effects shortly. There is a basic set of options in the menu, along with some useless filler thrown in for good measure. You have single game, full season, multi-player, a home run derby, and a useless stadium tour where you can simply view all of the different stadiums… and yes, the stadium tour is as stupid as it sounds. I was almost fooled into enjoying the gameplay for the first few games that I played until I realized how much TWI rushed this game. To start, the players are very large and seem decent at first, but then you’ll realize that they all look the same no matter the team, except for different skin color. The next thing that really annoyed me here is that despite all the 32X’s capabilities, the players still don’t move their legs; they still simply slide around on the ground. It’s really lame and cheap to look at. Have any of you ever heard the phrase “some days you get the bear and other days the bear gets you. ?” Well that phrase basically describes the way the games will play to a tee. You will win one game with a score of like twelve to one and the next game will be the complete opposite, and that’s on standard difficulty. Maybe they just modeled the team’s stats after the Chicago Cubs. Heck if I know! What’s worse? Many times, the outfield will catch a fly ball, and you’ll still be safe at first base. HUH? For real Time Warner? There’s a home run derby here too so I figured it’d be a good way for me to get some more mileage out of this game. That was until I discovered just how hard it is to actually hit a home run. I was lucky to hit one or two runs in any one derby, but if you choose Frank Thomas you can almost hit every ball out of the park blindfolded. Yeah, it’s definitely a bit skewed if you ask me. How about the visuals aside from the players? Well let’s see. Everything is bigger this time around but not any better looking. For example, the pitchers look like they came from a 1930’s cartoon, and everything else looks about as basic as was permitted. The music is underwhelming and doesn’t even try to fit the mood of the game. The seventh inning stretch sounds especially lame. The worst part of the game has to come from the commentary. Not only does it not sound any better than earlier games, but it’s not even accurate. They were so lazy that the commentary doesn’t even match what play it’s commenting on half of the time. You can hit a line drive down left field and the commentary will say “to first base.” That’s just one example, but the commentary can literally get that screwed and misjudge calls that badly. You have to play it and hear it to believe it. You’ll be happy to know that Time Warner did its signature end game spam fest here too, telling you to play its other games released at the time. I think it’s pretty funny how most of the games advertised here sucked just as bad as this one does. Wonderful track record huh! Needless to say, R.B.I. 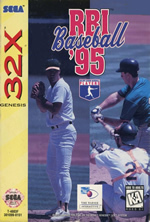 Baseball ’95 isn’t worth the time tracking it down or playing it. It was almost the series’ swan song, as it seems like Super R.B.I. Baseball for the SNES came out a bit later, but it most definitely sealed the R.B.I. series’ fate! 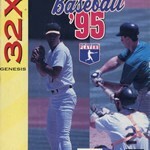 Tags: 1995, 32X, Baseball, R.B.I. Baseball article series, Sports, Time Warner Int.